Amazing appetizer for a casual dinner - kudos Ayn! 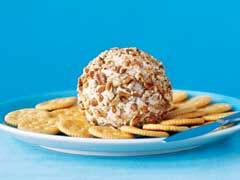 "Celery, bell pepper and onion are the unexpected ingredients in this otherwise sweet cheese spread." In a medium bowl, combine cream cheese, celery, bell pepper, onion and crushed pineapple. Divide the mixture in half to form 2 balls. Roll each ball in the pecans. Chill until ready to serve.